Creativity and organization are not incompatible. In case you haven’t read my last couple of blog posts, I have been discussing how some books, articles and other literature have been claiming that messiness aids creativity, while others claim the opposite. Mehmet Oz and Mike Roizen, authors of YOU: On a Diet, claim that visual clutter slows down the brain. That’s why clusters of road signs double the chances of missing the one you’re looking for. It also explains why website designers aim for simplicity. As we read more about the workings of our brain, we also learn even more about the importance of getting organized. For example, according to neuroscientist Torkel Klingberg, author of The overflowing brain, the more items on your desk, the greater the demand on your attention. And mental clutter is a suspect in the cause of age-related memory losses. Clearing clutter from your desk, office and home and leaving more wide open spaces also helps to clear your mind so it will be more productive. There is a seemingly opposing view that mess is great for generating ideas, and many people (including a successful TV personality and producer) feel they are successful because of their messy environment. I take the middle ground, and mentioned in my previous articles how professional organizer Clare Kumar had referred to “process mess,” an acceptable temporary mess, generated by the nature of the work itself. The accompanying photo shows a view of my office before I started work in the morning. (The photo last week showed it during the writing process.) I admitted that I do get ideas during the messier writing process; but when it comes to the large part of my time involving administrative work, an organized environment wins hands down. I am a confirmed neatnik. (I have an almost irresistible urge to straighten pictures on the walls of someone else’s home when I am an invited guest.) Before I start writing, my materials are organized on and around my desk. Articles on the topic previously ripped from magazines, notes I have written to myself on the topic in the past, seminar notes on the topic, etc. are stored vertically in manila folders to my left. Books on the topic are within reach in an accordion bookcase on to the back of my desk (having been removed from my library of books in advance.) Electronic Kindle books on the topic are readily accessible on both my laptop and iPad, and articles, tweets and other items that I have written in the past are filed in electronic folders on my desktop. Everything is neat and tidy and ready to go – as depicted in both this week’s photo and the one posted two weeks ago. 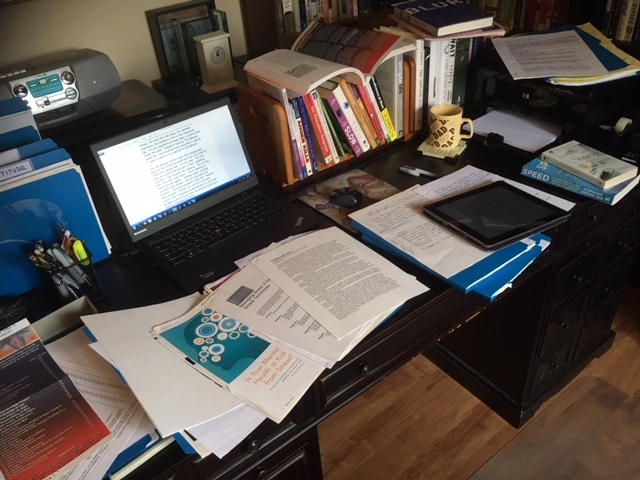 But once the writing process is underway, the neatness transforms into “organized mess” or “process mess,” which sometimes may slip into the “disorganized mess” category; but not often, since I usually write for only 90 minutes at a time. I described this stage of my writing process last week. If you want to have a working environment that is always supportive of creativity, try merging it more with nature. Richard Louv, in his book, The nature principle, claims that reconnecting to nature opens new doors to creativity, and that “creative people are often aware of being drawn to the outdoors for refreshment and ideas.” He mentioned that creative people like Albert Einstein and philosopher Kurt Godel used to take walks in the woods every single day at Princeton campus. In choosing your office and decor, you should not overlook indoor plants and greenery, window views of nature, and even paintings of flowers and landscapes. The more we gravitate toward the cities and hole up in our offices, the more we withdraw from nature and its largely unrecognized or unappreciated benefits. Studies have shown that the presence of potted plants, for example, improves not only creativity, but productivity, performance and learning ability as well. In the case of schools, the presence of plants improved scores in mathematics spelling and science between 10% and 14%. So it would appear that walking, thinking and working outdoors would be the first choice for generating ideas, and if you can’t do your creating outdoors, bring as much as possible of nature into your work area – even if it is just painting the walls green, the color most associated with creativity. In my eBook, How work environment impacts productivity, published by Bookboon.com, I relate some personal experiences with working environments. One of my most productive routines is to take a 15 or 20 minute nature walk, ending up at a coffee shop where I write the article dreamed up along the way. Most of the articles associating a messy environment with creativity (mentioned in my last blog article) referred to the ping-pong study where participants were asked to write down as many uses as possible for ping-pong balls in a given time frame. Those participants in a messy room came up with the same number of ideas as those in a tidy room; but the ideas were more creative. To use as a spike on which to skewer reminder notes, etc. To use as a writing instrument by splitting the end and dipping it in ink. To use as a shim to sturdy a wobbly printer or desk leg. To chew on – or to break into tiny pieces – when you feel stressed. To separate stacks of papers. To use as bookmarks to allow quick access to pages you want to refer to later. To clean between the keys of your laptop. To scratch an itch, and so on. You can see that the above list of ideas were generated, either consciously or unconsciously, by associating the toothpick with items on my desk or activities I was working on at the time. But if you have a vivid imagination, you could possibly come up with just as many or even more creative ideas while working in an organized environment. In your mind you can be as messy as you like for as long as you like, and I frequently have brainstorming sessions with myself when my supply of new tweets, time tips, articles etc. start getting low. I don’t want to be writing in a panic at the last minute -although this happens occasionally when life has other plans. What ideas did I actually get during my first few writing sessions while working on my stress book? Well, for one thing, while looking through the book Performing under pressure, I had the idea for another book on “staying on top of your job,” since getting behind in your work could create a lot of pressure on you. I also got a few ideas for tweets. For example, the fact that some people are creative in a messy environment and others in an organized one, gave me the idea “Creativity is all in your mind.” I might be able to do something with that one – perhaps even as a title for this article. I was also reminded that I should revise and reissue my old stress resistance quiz. I’m sure I’ll get more ideas as I continue writing my book. It always happens. And I’ll be sure to jot them down at the time so I don’t forget them – and continue with my writing. I use our Daily Priority Pad (available at our website) to do this. It was actually designed by my son Jason, who found he needed something to use in tandem with his iPhone. It is ideal for my writing sessions since I can quickly jot down things I need to do, ideas for the future, people to call – and there’s even a “Back Burner” section for future book ideas or future plans. I don’t let ideas, creative or otherwise, distract me from my writing if at all possible. I even put my iPhone on airplane mode while I’m writing. I’m not sure if you’re really interested; but in my next blog articles I will describe how I collect and store all the reference materials that I use in my writing and perhaps a few ideas on writing that have proven useful – and of course a little more on this creativity debate. When it comes to keeping information, people may label me a pack rat; but it has helped generate 23 e-books, two paperback books, hundreds of articles, and thousands of tweets in the last six-years, not to mention material used in my newsletters, seminar notes and PowerPoint presentations. Everyone has their own method of writing. There is no one best way. But I do agree with professional organizer Clare Kumar when she claims that “process mess” is natural occurrence, and not something that should label you as a messy. Life is good. And full of ideas waiting to be harvested. Many years ago a TV personality from Montréal, Canada, interviewed me during a National Association of Professional Organizers conference in the U.S. It was for a TV special he was doing on messiness. Naturally, considering what I do and what I preach, I explained the various benefits of getting organized and working in a tidy office – emphasizing its impact on efficiency and personal productivity. It turned out he was a messy himself, and proud of it. I soon discovered that he was a creative genius in his field. He spent an equal amount of time telling me the merits of messiness and how it relaxed him, inspired him, gave him pleasure, and of course creativity. I gave it my best shot, including the average time wasted searching for things, the interruptions, and the lack of focus and so on – to little avail it seemed at the time. He kept returning to the joy he received from his messy environment. Probably through frustration, I ended up telling him something to the effect that if he found a messy office was pleasurable, relaxing, and inspired his creativity, then he should keep it that way. But once he had dreamed up a new project and was ready to get down to business, he should move to a second office – one that was organized and more work-friendly. There he could complete the project efficiently, effectively and on time. It was a tongue in cheek suggestion, and I must admit I was a little embarrassed and resentful at the time that I was unable to present my fellow organizers in a more favourable light. Fast-forward about 20 years, and I recently read several articles on the merits of a messy desk and its relationship to creativity. One of the articles was titled “It’s okay to have a messy desk,” and subtitled “It’s also fine to have a clean one. There are advantages of both,” written by Diane Peters. Now the lightbulb turned on. Claire had hit the nail on the head – “process mess.” I feel I have an organized office – when I’m not working. 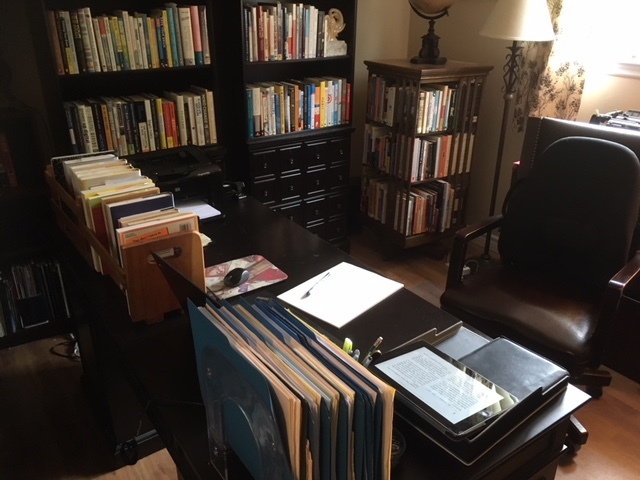 But once I start the writing process, which consumes about half my time, I have reference books, notes, photos – you name it – strewn about my desk. I try to keep it all visible, and in different areas of my desk; but if you walked in on me, it would appear as clutter. My eyes dart from one piece of paper or book to another as I write, make notes, and dictate to my computer in any order. I sometimes start to write a blog article, and it ends up being a book. I just keep writing a series of blog articles on that topic and later piece them together to create the book. At the same time, get my supply of tweets from ideas generated by other people’s books or articles as well as ideas for new seminars to deliver locally. I continually make side notes of ideas that come to me during this “writing” process. I prefer to call it “organized mess”; but it does stimulate creativity. It’s akin to brainstorming, where one idea generates yet another. Once I have completed the “creative writing” part of the project, however, my desk is once more neat and tidy, and the “administrative” portion begins. The books I write for Bookboon.com require a bibliography, both a long and short description of the book, a “multiple choice” quiz, formatting according to their specs, and so on. In the same way, when I self-publish a book, I have to go through the various steps to make it print-ready, including the cover, size, paper stock, layout and so on. A significant percentage of everyone’s time is administrative, not creative. For some people it may approach 100% administrative, depending on their job. In that case their desk and work area should be organized to facilitate efficiency, not creativity. If you have a job requiring creativity, you don’t need a separate office – as I once blurted out to the interviewer. You just need an organized one, with a guilt-free allowance for what Claire Kumar refers to as “process mess” as the need arises. I’ve never yet met anyone who has a job that is 100% creative. If there is such a person, I know where he or she can find an office to replicate. It’s somewhere in Montreal. 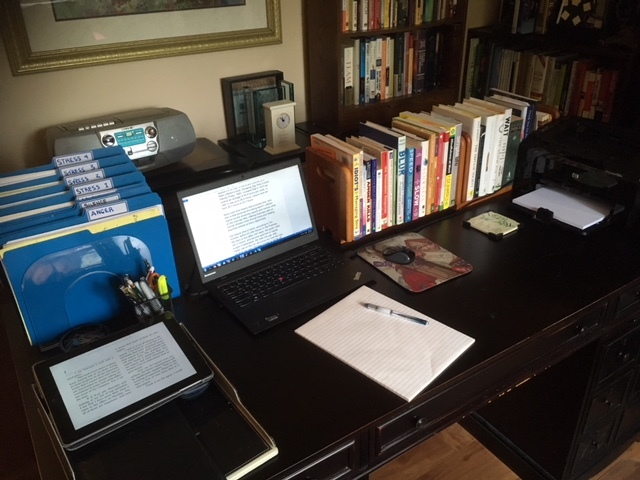 I snapped the accompanying photo of my desk just before starting to write a book on stress. I snapped another photo at the end of my writing session, which I will include with next week’s blog article. At that time I will provide more detail on my tidy-neat-tidy writing cycles – and how ideas are frequently generated during the process. Alex Osborn came up with the brainstorming technique back in the late 1940s, and a set of guidelines that we followed for decades. Basically, it involved a group of people blurting out ideas, no matter how ridiculous, without fear of intimidating guffaws, prejudgment or negative reaction of any sort. Through the process of association, one idea, no matter how ridiculous by normal standards, may lead to another and eventually to a perfectly workable idea, which may never have been uncovered by traditional thought processes. 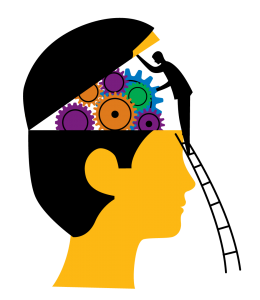 It was thought that the rapid fire thoughts in a successful brainstorming session would seem to come directly from our creative right brain before our logical left brain had a chance to put a damper on them. And it seemed reasonable that more ideas would come from a group of people than from brainstorming alone. But more recent research has revealed that both the belief that groups came up with more ideas than individuals, and the belief that criticism or even questioning ideas during the brainstorming session would be counterproductive, are both wrong. Jonah Lehrer, in his book, Imagine: how creativity works, goes so far as to say that brainstorming in a group, rather than unleash the potential of the group, actually suppresses it, and makes each individual less creative. He believes that the only way to maximize group creativity is to encourage a candid discussion of mistakes. A study in Psychological Science also found that group decision-making makes people more likely to reject outside information. Shelley Carson, author of the book, Your creative brain, agrees, saying that research on brainstorming yields more quality ideas when individuals brainstorm alone and then have their best ideas evaluated by a group. It is believed that even though the brainstorming process is supposed to be nonjudgmental, individuals may be wary of shouting out ideas that their superiors might think are foolish. A newer technique called brainwriting has each member of the group generating from 3 to 5 ideas written on an index card and passed anonymously to a spokesperson who then introduces the ideas to the group for further exploration. Julia Cameron, author of the book, The artist’s way, agrees that dominant people tend to do most of the talking and groups inhibit a lot of creative expression. She has had a brainstorming team work together for five minutes, then work individually for five minutes, and then come together again for the final five minutes. She says it boosts group creativity – with twice as many ideas generated than staying together as a team for the full 15 minutes. She attributes this improvement to the fact that everyone has an opportunity to work on the problem individually. There is more information on brainstorming and other techniques of creative thinking in my eBook, Creativity in action, soon to be published by Bookboon.com.